On Saturday 2nd June 2018 a significant moment of history was hosted on the ITTF World Tour stage as the first Mixed Doubles final was played out at the Seamaster 2018 ITTF World Tour Platinum Kaisa China Open. Relive the historical occasion and the drama of the run-in to the two singles finals on what was a day of immense pride for Chinese table tennis. 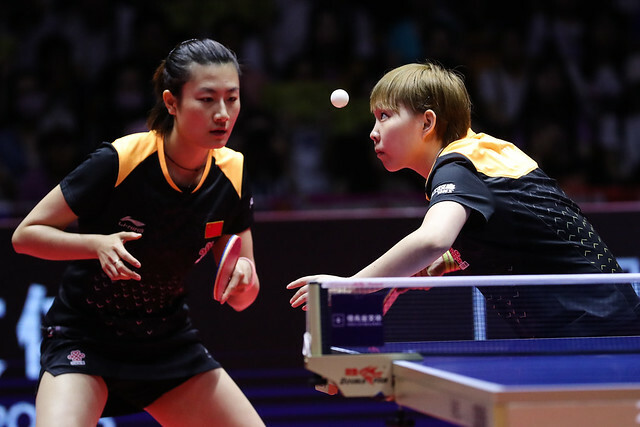 History was made on day three as China’s Lin Gaoyuan and Chen Xingtong emerged as the first partnership to win a Mixed Doubles title on the ITTF World Tour. The sixth seeds came out on top against the top seeded pairing of Japan’s Masataka Morizono and Mima Ito across four games (13-11, 7-11, 11-5, 11-8), a special moment for Lin Gaoyuan in particular who was born in Shenzhen. Entering the Men’s Singles draw as a qualifier, a semi-finals finish for Korea Republic’s Lim Jonghoon marks a massive milestone moment in the young player’s career especially when you consider the level of opposition he has accounted for in Shenzhen. Beginning his main draw campaign with an outstanding result against third seed Xu Xin, Lim Jonghoon went on to beat 15th seed Chuang Chih-Yuan and then this morning he added fellow Korean star Lee Sangsu to the list (11-9, 11-9, 11-5, 11-6). However, he finally met his match in the concluding tie of the day with Ma Long sealing his spot in the final with a strong outing in the last four (11-9, 11-3, 11-4, 10-12, 11-2). Awaiting Ma Long in the title match is none other than top seed Fan Zhendong, who started his day with a five games victory over Japan’s Koki Niwa (11-9, 11-6, 12-10, 9-11, 11-3) before a confident display against No.4 seed Lin Gaoyuan (13-11, 11-6, 12-10, 9-11, 8-11, 11-6) rounded off another fine day at the office for the 21-year-old. Japanese hopes were ended in the Women’s Singles event after both Mima Ito and Saki Shibata exited the proceedings at the penultimate stage of the competition. Claiming an impressive victory earlier in the day when she eliminated fellow compatriot Kasumi Ishikawa in the last eight (11-2, 8-11, 12-10, 11-8, 3-11, 11-7) but for sixth seed Mima Ito the journey would end one round later, falling to fourth seeded opponent Wang Manyu (11-8, 12-10, 11-5, 10-12, 11-8) in a repeat outcome of their recent encounter in Hong Kong. The other semi-finals fixture saw Saki Shibata’s wonderful run in Shenzhen brought to a close: the qualifier lost out to World and Olympic Champion Ding Ning in straight games (11-2, 11-7, 11-9, 11-6), but the young star from Japan can leave with her head held high having beaten three seeded players during her campaign in China including top seed Zhu Yuling in the last 16.